We’d love your help. Let us know what’s wrong with this preview of Defying Shadows by Ashley Townsend. One choice can define your future. At first, Sarah’s return to twelfth century Serimone is as wonderful as she could have hoped—reconnecting with Will and celebrating the union of her two friends—but things quickly fall to pieces when she uncovers something that could unsettle the new regime. Before she can share this information, Sarah is forcibly whisked away by the one m One choice can define your future. At first, Sarah’s return to twelfth century Serimone is as wonderful as she could have hoped—reconnecting with Will and celebrating the union of her two friends—but things quickly fall to pieces when she uncovers something that could unsettle the new regime. Before she can share this information, Sarah is forcibly whisked away by the one man she thought she’d never see again: Damien Lisandro, the friend who betrayed her and the traitor who was supposed to spend his life behind bars. Even more unsettling is the revelation that the mystery they had solved is far from over as a dead man comes back to life with the intent of corrupting the future. In Will's desperate attempts to find Sarah, he uncovers the mystery that she left behind, putting into question the kingdom’s past and the motives of its current king. But the madman whose mission it is to change history will stop at nothing until he succeeds, and a team of ragtag time travelers are the only ones left who can stop him. To ask other readers questions about Defying Shadows, please sign up. + even a dash of nautical adventure! It just has EVERYTHING, I tell you. There were so many revelations and plot twists, which I so enjoyed! I guessed a few of them, but if anything that made me love it even MORE, simply because I was so excited to see them unfold the way I wanted them to. :D It blew my mind SO. MANY. TIMES. and made me so excited and I just loooooved that. I enjoyed the first two books (Rising Shadows and Chasing Shadows), but this one I really LOVED. I was daunted by its size, but while I was reading it, it didn't seem long at all—it was just the right size and needed that length because of ALL the things that happen. I would also say the writing is AMAZING in this book. It's improved a lot since the first two. (They were by no means bad! But with this one, the writing has grown by leaps and bounds!) It's exciting to watch an author grow from book to book, and I'd say Ashley Townsend has definitely come into her own. This book was so well written. Huge thumbs-up on all of that! + Obviously I abhor the villains who shall also remain nameless and are all horrible which means they're doing their job. XD They were just UGH. Really nefarious and well-written. And just... SO MUCH STUFF GOING ON. I'm so amazed at how many character plot threads managed to fit in this story! So many characters had so much going on and it managed to weave together and just wow. Call me impressed. As this exciting chapter of her life nears its end, Sarah must finally choose between Serimone and her world--between the easy choice and the right one. This review is going to be full of spoilers and feels, if you haven't read this book(or the first two books in this series) what are you doing? GO READ THEM! There aren't enough stars to rate this book! It is amazing! It took me far too long to get around to reading this book, but it turns out I read it right when I needed to. This book is all about goodbyes and living life and moving on and that's just what I needed. The first part of the book starts of slow. It is all nice stuff to read about, but the book really doesn't get going until after about 8o to 100 pages in. But then, I couldn't put it down and read it in one day. This book really brings There aren't enough stars to rate this book! It is amazing! The first part of the book starts of slow. It is all nice stuff to read about, but the book really doesn't get going until after about 8o to 100 pages in. But then, I couldn't put it down and read it in one day. This book really brings the timey-wimey, crazy time-travel stuff. So good! And I love how the ending resolution isn't the usual answer to two people in love who are separated by time. The ending doesn't pull the punches. It goes for all the heartaches and heartstrings. Even though I was sure it would have a happy ending, I still teared up at one point. I was chosen to be a beta-reader for this book *cries with joy* by Ashley for an honest review of this installment in her amazing trilogy. As for the review, I cannot possibly say much to criticize Ash's work, however, some plot twists were kinda foreseeable, I enjoye I was chosen to be a beta-reader for this book *cries with joy* by Ashley for an honest review of this installment in her amazing trilogy. As for the review, I cannot possibly say much to criticize Ash's work, however, some plot twists were kinda foreseeable, I enjoyed them nevertheless. The thing I didn't see coming was Damien's fate. I remember how in our previous conversation she had told me that he would play a big part in Book 3 and he is and always will be mine as well as her (I hope I remember correct) favorite character. Naturally, his development throughout the series is admirable. In the end he became the hero I always wished him to be, and even though his dying made my heart wrench badly, I'm glad that he found the true path and did bot deter from it. His love for Sarah is something I always wish I can have. I mean, I do ship Sarah and Will, but Damien! I don't need to say any more. :) I just loved his dynamic. Will went through major changes as well. I knew he'd be alive after the ship went down, don't know how; just do. His faith being turned around and his life taking a better course made me feel satisfied. After watching him struggle with the concept of God and His love, he finally attained peace. I do however feel angry at him for leaving Damien to be hanged. I know the situation was such and he couldn't possibly have done much, but I wanted him to try and save the man who had given up everything for the woman they both loved..
Sarah, was somewhat of a conflicted mess for the major part of the book. I felt as though her character would not have sit by idly at Jade's place when everything was happening and that she would do something. That aside, she will never cease to amaze me by the strength she holds in herself. Her feelings towards the Jones, Will, Damien, even Jade - seemed so selfless and pure, no matter what they were. She was never one for pretenses. Demetrius coming in the picture was a bit surprising, and didn't make much sense to me until the end when everything made sense. His involvement with Cadius was something I became wary of. However Cadius himself could not outsmart the monster he had created. I'm glad he saw what he had created and feared because of what he did to his son which in turn resulted in his demise as well as Adrian's. The tone of the novel seemed a bit slower than Chasing Shadows. The one thing I enjoyed were the different places that the characters visited. Be it the present or the past. I do admit I would have absolutely loved to see Will adjust to the new life, although he did not seemed as surprised by everything that he saw, which was sad because this world is so different from the time he was born. I guess he didn't express his emotions enough.. I was super scared about the whole Robin Hood - Marian thing. I mean, Jade evolved so much in the end, it was hard not to care for her however snarky she be; but I'm so glad she found someone who courted her as she deserved after losing everyone else. I wanted more interaction between Saran and the Queen, since the way the story was portrayed, they seemed to understand each other very well, despite meeting only twice; that too briefly. Due to the Queen's affections towards Sarah, for a second I thought she wanted her to marry Adrian or something similar. I have to be honest! THIS BOOK IS THE FIRST FREAKING EVER FANTASY BOOK THAT I ACTUALLY CRIED!! and that epilogue... Gah! That was brilliant. I dont have anything else to say other than I love this book and trully wanted to have the physicall one. Like seriously?? I just finished and miss Will and Sarah and Karen and Damien and Ugh! I cant choose my favorite because they are all! let me just start off by saying that i am in love with this book! the story is written fantastically and while maintaining a gripping storyline with tons of plot twists (lmao), the book also gives importance to various virtues like friendship, sacrifice and faith in the almighty. the book is narrated by the first person's point of view, and the author has included a quotation before the beginning of each chapter which i think is a lovely special touch to the novel. the story kept me completely en let me just start off by saying that i am in love with this book! the story is written fantastically and while maintaining a gripping storyline with tons of plot twists (lmao), the book also gives importance to various virtues like friendship, sacrifice and faith in the almighty. the book is narrated by the first person's point of view, and the author has included a quotation before the beginning of each chapter which i think is a lovely special touch to the novel. the story kept me completely entertained and made me smile and sob, while also making me crave more! I'm dying of feels right now. Amazing book. I just … can't. Skipped to the end to see how it all worked out. I laughed and I cried and one day later my heart still cries out! I was very lost to start, as I have not read the prequels to the book. But after a few pages in, I was hooked. The book has everything a fan of Young Adult science fiction could hope for. Romance, plot twists, mystery, adventure, joyful and sorrowful moments... I would be very surprised if the book did not bring out some deep emotions within you. The theme of unconditional love and friendship can be found through out and it affecte I laughed and I cried and one day later my heart still cries out! The theme of unconditional love and friendship can be found through out and it affected me deeply while reading (without being cheesy or too much). I am a strong believer that if an author can stir those deep emotions within you she/he deserves high praise. And Ashley Townsend, most certainly does. As you read, you will feel everything the characters are feeling. Damien, one of the main characters in this book, will be in my mind and heart for a long while. I don't know much about his previous history, for what I understood it was not all very good, but it makes for a great third book. The time travel side of it is very cleverly written. I personally find only a very few writers can pull off writing on time travel without sounding very tacky or too simplistic. Neither the case here. The book also has some strong Christian notes. They are skilfully incorporated and bring out the imperfect side of our human nature, making it easier to relate to the characters. I think Sarah is meant to be the main character, but I will confess she is the one I related to less. Damien takes a much stronger role to me and I absolutely love his character. Jade coming close second. But I will not say more and spoil the fun for others. All in all, a great read. One I could not recommend enough. The only downside of the book is particular to me, there were a lot of missing links, things I wish I knew but didn't because I have not read the other two. I will try to make this review as honest as I can, but realize that I very much have a biased opinion. I cannot say that it is good or not, but I throughly enjoyed it. Ashley's writing has matured since Rising Shadows and has vastly improved since chasing shadows. She maintained her ability to paint vivid pictures through her diction and brought the reader as if they were at Serimone, and her description of the ruins was well written and descriptive. She wrote about specific scenes that brought I will try to make this review as honest as I can, but realize that I very much have a biased opinion. I cannot say that it is good or not, but I throughly enjoyed it. Ashley's writing has matured since Rising Shadows and has vastly improved since chasing shadows. She maintained her ability to paint vivid pictures through her diction and brought the reader as if they were at Serimone, and her description of the ruins was well written and descriptive. She wrote about specific scenes that brought you there. Here writing was less choppy and had a clearer voice and focus than in chasing shadows and it was noticeable the direction that she wanted her characters to go. Ashley did a stellar job of not noticeably foreshadowing upcoming portions of the story. When the scenes occurred it was if you were walking into a wall, well duh. In chasing shadows and rising shadows Ashley foreshadowed many of the events that would happen later in the story and it was more noticeable. Overall it was a book that I thoroughly enjoyed reading every word Ashley had written, I found it hard to the book down and sadly disappointed that the story for these characters had to end. I enjoyed her utilizing her interest in Robin Hood and Maid Marian and how they came about. She added a nice origin story. Wow, what a phenomenal finale to an amazing trilogy! It's crazy for me to think about how talented Ashley has gotten at crafting such brilliant novels with captivating plot lines. With each book she writes her characters become more developed, her writing more gripping, and storylines more riveting. It was nearly impossible to get me to put Defying Shadows down, the result of becoming completely enthralled in this enchanting novel where there is adventure on every corner and the OTPS give me way too many feels for my heart to handle. Never before have I read novels like these that combines Christian fiction and time traveling, but I would certainly like to read more! The way Ashley is able to fit so many elements into one book and still make the writing fluid and the story flow is remarkable, making me want more of this magnificent world she has created, and I sincerely hope she writes another book! This third and final book in the Rising Shadows trilogy does not disappoint. Though the plot could move a touch slowly at times, and I saw almost all the major plot twists coming, it was still a very well written and intricately plotted story. Sarah seemed a bit stronger than she did in previous books, and I'm glad the author didn't take things too quickly with the romance, nor did she just forget about her family back in the future. The ending was strong and satisfying, though a touch bitterswe This third and final book in the Rising Shadows trilogy does not disappoint. Though the plot could move a touch slowly at times, and I saw almost all the major plot twists coming, it was still a very well written and intricately plotted story. The ending was strong and satisfying, though a touch bittersweet. I will be interested to see what this author writes next. Ahh where did my review go?! Can I just leave the review at that? I don’t feel like anything else needs to be said. Okay, fine. Defying Shadows by Ashley Townsend is the 3rd and final installment of the Rising Shadows trilogy. And what a finale it was! Once I finished the last page, I just had to sit there for a minute so my tornado of emotions could have some quiet time and calm themselves down. These stories are about Sarah Matthews, a 21st century gal who got swept into the 12th century by accident by some THE FEEEEELS!!!!! These stories are about Sarah Matthews, a 21st century gal who got swept into the 12th century by accident by some time traveling watches. In the first two books, she landed in a place called Serimone, and made quite a few friends and enemies along the way. And then of course our dear love interest, Will. In this 3rd story, she’s returned to the 12th century for a wedding, only to discover her enemies are back and the future of Serimone could be entirely destroyed. The story starts out with a timey-wimey bang that totally had me reeling. Just give me ALL the time travel-y things, please and thank you! Unfortunately, once the exciting, wibbly-wobbly prologue is over, the rest of the beginning is sloooow. There were a lot of scenes of just dialogue and normal, every day activities like getting dressed and fixing hair and whatnot that seemed like it could have been cut or broken down into just a sentence or two instead of entire paragraphs. I had a rather hard time getting through the first few chapters. Nothing really…happened. BUT I didn’t mind much because I was so very happy to return to these characters. All of our beloved characters are back, and it was like being reunited with dear friends. Sweet Sarah, precious Will, spunky Karen, the whole endearing Jones family, and, of course, Damien. Sweet, sweet, loveable, if not slightly deluded, Damien. . . Ahem. There’s also a little gaggle of side character, all of which made me smile. Well, you know, except the villain, to whom I wanted to punch in the face. But that’s normal…right? What I love about the cast is how real everyone felt. They’re all people, with hopes and dreams and fears and doubts. Their emotions jump from the pages and squeeze your heart until you just want to hug everyone, and wish they were your friends in real life. The best part about the characters was how they had grown and changed from the first book. With each book, they endure more, grow closer, become braver. The 2nd book especially had some of the best character arcs. And the effects are still there in this story. I can’t stand when a story ignores the character growth that happened in a previous story, and the characters revert back to their original selves. If there’s character growth, I want to see them changed permanently. And Defying Shadows had just that. These characters are much more mature and brave and selfless people than they were in the 1st book. The consistent character growth made me want to high-five the book and give it a gold star. And, better yet, we get even more character arcs in this one. The characters just keep growing and growing and excuse me while I go cry and hug the book because MY PRECIOUS BABIES. This author is a master at character arcs, let me tell you! Once we get past the slow beginning, things really start to pick up and the plot thickens. We only thought things were dire in the last book. Haha. HAHAHAHA! The stakes have upped, and Sarah is thrust into a much deeper plot than she ever imagined. The layers of plot throughout the trilogy were phenomenal! I was blown away with how the plot was layered on thicker from the 1st book to the 2nd. And even more so with the 3rd. Now the plot comes fully revealed, and what you might think is insignificant in one book, plays majorly in this one. Some seeerious plotting by the author must have gone on for this trilogy, because it was amazing seeing the plot grow and grow, one layer at a time, building up upon one another. Also, the Robin Hood legend is a particular little subplot for these stories and there was one Robin Hood-y reveal in this one that made me squeal and want to jump up and down and huggle the book. But, of course, spoilers. You’ll just have to read it! *cackles* BUT ROBIN HOOD, PEOPLE. Now, I will say, sometimes the plot got pushed to the background in favor of character relationships. But that’s okay. I may have noticed it more because I tend to read much more plot focused books vs. character centered ones. Sometimes this felt more like a romance story than an adventure, time travel tale. Which, again, isn’t a bad thing! It’s just not something I read much of. But watching Sarah and Will’s relationships develop and grow turned me into a fangirling mess, and I could happily read about these precious babies forever. I mean, a 21st century college freshman and 12th century blacksmith together. ALL THE CUTE. These are YA books, but I’d say for a bit older YA. There are some heavy themes within. There’s some mention of a woman who sells herself, though of course it was only mentioned, never ever shown or dwelled on. And told very much in a bad light. We also have a royal scandal from the past mentioned that involved intimacy out of wedlock. At one point there’s a party with some alcohol, though the main characters don’t drink any that I can remember. Someone drops a key into their cleavage. Another time a guy is shirtless and a girl stares at his form. Since the stakes are so high, there’s definitely violence. Mostly just revealing the after effects of fights, such as bloodied bodies and such. The big thing is there’s lots of passionate kissing and touching. Nothing beyond kissing, but it’s very…strong kissing. And much of it. So if that’s not your thing, be warned. I very highly recommend reading the first books before this one (particularly book 2), but once you do you’re going to be desperately getting your hands on this one. And, trust me, you won’t be disappointed. This book felt real, the characters were loveable, the plot all manner of fun, and the EMOTIONS. I was honestly a sobbing mess by the end, and I usually don’t do more than shed a tear while reading, if even that. I’m having the hardest time saying goodbye to my beloved characters. But it was a beautiful conclusion to a spectacular trilogy. Also, there was a horse named Darth Vader in the 12th century. YES. YOU NEED TO READ THE BOOK. Thank you to the author for sending me a copy of her book to review honestly. Unfortunately, none of the characters really spoke to me. Granted, this could be because I haven’t read the other books in the series, which more than likely hindered my experience because I couldn’t really map out the character development of Sarah or the others. My experience with the characters were based solely on Defying Shadows, with no real previous knowledge of their actions in previous books. However, the book d Thank you to the author for sending me a copy of her book to review honestly. However, the book did provide details on past actions, which I appreciated. Actually, these details were my saving grace reading this book because otherwise I would have been completely lost as to what was happening! But given the details I was, I was able to follow along with the story. And I actually really liked it! Also, Townsend is a master of descriptions. She transported me into another world. I was so excited to finally get to finish the adventures of Sarah and Will and all their friends. Defying Shadows was a terrific ending to a wonderful trilogy. The ending really had me smiling! I thoroughly enjoyed these books and am looking forward to reading more books by Ashley Townsend. The last book in the Rising Sh Review to come! The last book in the Rising Shadows was simply amazing! I experienced a whirlwind of emotions while reading, from laughing hysterically to fangirling to gross sobbing. Yeah it wasn't always pretty. But Ashley Townsend has created yet another fantastic addition to this series, and while it is incredibly sad to have this be the end of the series, I am so happy with how everything turned out. I seriously don't know how there can be no more Sarah, Will, or Damien in my life, but that's what re-reading is for!! Ashley showed tremendous growth as an author in this novel, and even though this was an early copy of this book, it is clear how truly gifted she is as an author. One of the best parts of this book (and series in general) is the characters. Every single character has a special place in my heart, and has grown so much since the first book. Sarah is such a remarkable character. She is brave, strong, and never once loses her faith....even when times get extremely difficult. I did like that Sarah's strong faith played more of a role in this novel as opposed to the last novel. However, Ashley found a nice balance between Sarah's faith and the fantasy elements of the story. Sarah's faith is seamlessly woven into the story, and it just fits. It is never forced on the reader. It is simply a part of who Sarah is, and it's a part that you love about her. Moreover, Sarah truly steps up by fighting for what is right and just. She doesn't back down from those that are threats. Lastly, she was extremely realistic, and that is what made me connect with her even more. Another wonderful aspect of this novel was the plot and the setting. Ashley has crafted such a wondrous story and world that I never want to leave. In this book though, we get to experience not only the past, but the present and the future. These made for some thrilling moments, and I was so excited to see how every little action from beginning to end made an impact on the final outcome of the story. While this book was a little bit slower than the previous two, it allowed for a slow burn until a heart-stopping ending. The entire epilogue of this book was utterly breathtaking. Beautifully written and the perfect way to end a series, this epilogue made all of the sad events worthwhile. I will say that it did leave me crying a bit, but everything is wrapped up nicely and all questions are answered. Overall, I would highly recommend this novel if you are a fan of the Rising Shadows series, and if you haven't started the series yet...what are you waiting for?! Prepare for an epic thrill ride that will leave you guessing until the end. There are betrayals waiting around every corner, surprising twists and turns, and a romance for the ages. This book has it all and I can't wait to check out more from Ashley!! 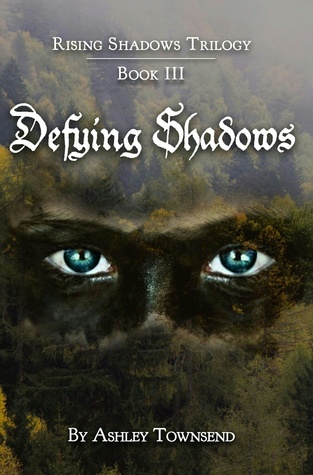 Defying Shadows is the story of a young college student, Sarah, who is just about to start her Christmas vacation, when she gets an unexpected visit from her best friend and is suddenly (not for the first time) thrown back in time to the 12th century to the charming medieval kingdom of Serimone. This book has it all. My most admired thing about this book though is the way each character is so imperfectly human, and how easily I am able to feel and understand each emotion with how well written th Defying Shadows is the story of a young college student, Sarah, who is just about to start her Christmas vacation, when she gets an unexpected visit from her best friend and is suddenly (not for the first time) thrown back in time to the 12th century to the charming medieval kingdom of Serimone. This book has it all. My most admired thing about this book though is the way each character is so imperfectly human, and how easily I am able to feel and understand each emotion with how well written they are. I felt everything these characters felt. Their joy, sorrow, passion, rage, and absolute heartbreak were with me. Ashley Townsend has such a way with words that she makes sure of it. Throughout this book I never once had to take myself out of it to figure out what was going on. Every turn of events (and there are some great ones) is written so gracefully they never feel forced on the reader. Every character decision is easily understood, even if at the time it is hard to agree with it. I finished this book late at night, having tears in my eyes for at least the last 5 chapters. I was never able to guess at how it would end, and I am glad of it. Defying Shadows is a beautifully written story of hope, heartbreak, faith, and forgiveness. I ended it feeling like I was saying goodbye to friends, and wanting to plant a yew tree in my backyard. I want to thank Ms. Ashley Townsend for sending me a copy of this book. Defying Shadows is a great book but I didn't really love it. I like how the author wrote the book but there are also some times when I get distracted. I sometimes feel like there are too much words. Too much description and everything. I had a hard time reading the first part, I was really confused but I think the questions I had were answered as I continue to read and learn abut the characters more. I like the characters es I want to thank Ms. Ashley Townsend for sending me a copy of this book. I had a hard time reading the first part, I was really confused but I think the questions I had were answered as I continue to read and learn abut the characters more. I like the characters especially Sarah but I feel like she didn't really catch my heart. I like her but she's not enough for me. I want more Sarah and I want to really know her. I rated this book three out of five stars because I think it's good. There are some parts that I really liked and made me laugh. It was funny and romantic and sad at same time. Ashley is a young twenty-something author at Ink Smith Publishing and has been spinning tales since she discovered that her wild imagination could make a career. She is a native to bookstores, coffee shops, the beach, and San Diego, CA. She also has an unexplainable aversion to clowns and describes outlines as a “proverbial noose.” Check out the Rising Shadows trilogy everywhere books are sold: Ri Ashley is a young twenty-something author at Ink Smith Publishing and has been spinning tales since she discovered that her wild imagination could make a career. She is a native to bookstores, coffee shops, the beach, and San Diego, CA. She also has an unexplainable aversion to clowns and describes outlines as a “proverbial noose.” Check out the Rising Shadows trilogy everywhere books are sold: Rising Shadows, Chasing Shadows, & Defying Shadows. Become a fan on Goodreads and follow her quirkiness at ashley-townsend.com. “but wouldn't it be easier to let go?" she whispered brokenly, desperately.